The Lenovo A1 tablet was first spotted late July when an A1-07 prototype hit the FCC. The leaked photos that followed afterwards proved to be true with regards to the 7-inch screen size and 1024x600 pixel resolution. Now, the Chinese manufacturer will be officially launching the A1 tablet at a starting budget price of just $199. The low price implies bare bones hardware, but the device should be fine for the average user not needing to stream 1080p movies while simultaneously playing Angry Birds and running Google Maps in the background. As such, expect to find Android Gingerbread, a single-core Cortex A8 1GHz CPU, front-and-rear cameras and up to a 32GB SSD. Lenovo will also be launching the Lenovo App Shop alongside the release of the tablet. 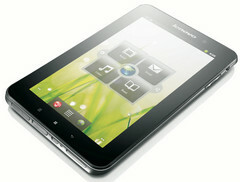 The store will offer apps specifically optimized for Lenovo tablets, such as the K1 and ThinkPad tablets. Of course, users will have full access to the Android Market as well. The A1 will even offer a decent amount of connectivity options. WiFi and GPS will be built-in, as well as microSD and SD expansion slots. According to Engadget, the 8GB model will unfortunately not ship in the United States. Instead, only the 16GB and 32GB models will be available for $249 and $299, respectively. Exactly when the budget-friendly tablet will arrive is not yet known, but it is expected to ship before the end of the year in multiple colors.